The Victorious Project is a vehicle for confronting the darkness of suicide. We are transforming a Winnebago Brave into a Golden Owl dedicated to bringing both hope to those who are struggling with suicidal ideation and healing to those who have lost loved ones. Owls are the messengers of the Universe. Symbols of both the mysteries of death and the hope of immortality. Victorious carries wisdom on its wings and courage in its talons. The outside of this mobile shrine is painted with the image of a bleeding heart with wings and covered in memorial feathers bearing the names of those who have passed. Victorious contains a a cosmic sanctuary for those seeking peace, hope and healing. The Altar of the Owl contains a glass egg where visitors may leave messages for those they have lost. Each full moon we perform a simple ceremony to honor the dead and burn these messages, releasing them to the heavens. Victorious also gives participants the opportunity to paint and decorate metal memorial feathers that become part of the Owl. The Victorious Project has partnered with several suicide prevention organizations and groups that facilitate long term healing for suicide survivors. Victorious is a response to the suicide of Victor Tilvaro in May of 2018. He was a visionary artist, a world traveler and a warrior for the Light. He spent his life boldly following his dreams and living from the heart. His creativity and character touched the lives of a large extended family of amazing people across the globe. The Victorious Project is a continuation of Victor’s spiritual and creative work. 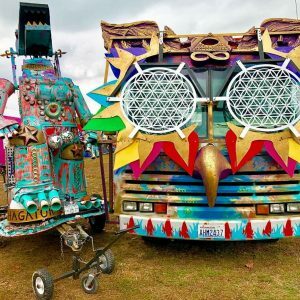 Victor left a legacy of incredible art and powerful ideas in his wake including the concept of transforming this Winnebago into an Owl art car. One of the crown jewels of Victor’s artistic works is the Space Sanctuary. This visionary art installation is a fully immersive space dedicated to healing, mediation and consciousness expansion. We will carefully deinstall the Space Sanctuary from its current location and rebuild it inside of the Winnebago where Victor spent his final days. The goal of Victorious is to share Victor’s work with others who are struggling with suicide and let them know they are not alone. Victorious is a living memorial, an exercise in hope, and an active transcendence of death.